Seven Christian churches formed in Earlville between 1844 and 1867. Most of their beginnings involved meetings in halls, school buildings or member’s homes. Late in the 1850’s when the CB&Q Railroad came through town the churches began to flourish as a result of the new businesses and increase in population. The first to gather in an effort to bring Christianity to Earlville was the Methodist congregation. In 1844 Rev. George Beggs began organizing classes in Methodism, meeting in member’s homes. In 1844 the group moved their meetings to the log house near the old section of Precinct Cemetery. The first pastor was Rev. Wesley Batchellor of Freedom. Their first church, a wooden structure located on Stilson Street, was completed in 1857. This building was razed in 1904 and replaced with the brick structure that stands today. The cost of the new church was $7,500. In 1905 the new church was dedicated, and before the conclusion or the day enough money was pledged to have the church completely debt free. Accounts of the church’s history and pictures are available in our files. 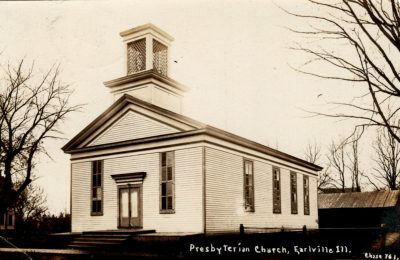 The Methodists were the first to “gather and meet”, however, the Presbyterian Church is the oldest church building in Earlville. Ten members organized under the direction of Rev. John Fleming. Those first meetings (1852) were held in the home of Joseph McGregor and later in the log cabin in the old section of the Precinct Cemetery. 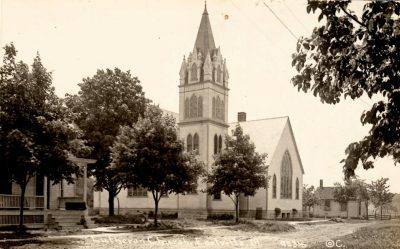 In 1855 the church building was erected on the northwest corner of Ottawa and Union Streets which, at that time, was in the center of the town. Rev. John Ustick was installed as the first pastor of the church. The original structure was razed in 1863 and a new building erected in the same location. The current sanctuary is part of that 1863 building. Names of initial members include Fleming, McLain, Holliday, Maguigan, McGregor and Orahood. Accounts of the church history have been written by Elizabeth Barnard (1952) and Robert and Berniece Harris (1989). A history of the Earlville Mariners was provided by Laverle Carter (1988). These, along with information on church anniversary celebrations, can be found in our files. In 1857 Fr. 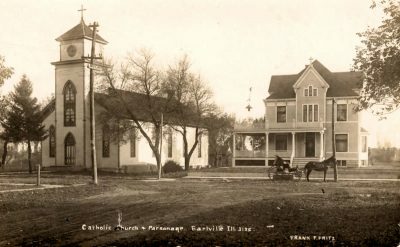 Murphy was assigned by the Diocese to come to Earlville and establish a Catholic parish. The first meetings were held in the homes of members, and, in 1858, St. Theresa of Avila was formally organized. Soon after, the members began celebrating Mass in an “old foundry” which was directly south of the Presbyterian Church on the southwest corner of Union and Ottawa Streets. In 1863 land was purchased a block west – the church’s current location – and a foundation was dug in anticipation of a new church. The church, however, was not completed until 1878 because of financial difficulties. In 1903 the church was severely damaged in a storm and was rebuilt. Because of the rapid growth of the congregation, St. Theresa became an independent parish in 1904 with a resident pastor, Rev. P.F. Sheridan. He moved into the newly built rectory in December of 1906. In 1913 the Universalist Church was being demolished. Adam Weis purchased the bell from that sale and donated it to St. Theresa. St. Theresa is the childhood parish of Archbishop John J. Myers and Father Chris Corel. The Museum has on display the wooden box in which the candelabras were shipped as well as an anointing set. Rev. J. Higby organized the first Baptist Church in 1859. Like many other early church communities, their services were held in school houses and empty churches. In 1871 a house of worship was built on the northeast corner of north Main and Brown Streets. 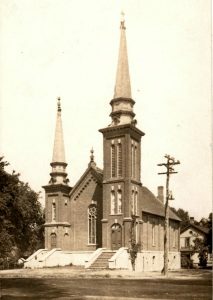 The church dissolved and the buildings razed in 1912. In 1867 a group of German immigrants who had settled in the Earlville area began holding meetings in that same log house near the old section of Precinct Cemetery. Services were conducted by Rev. Fuerchtenicht. The first church council was formed in 1868, and in 1869 the new church building on East Street was dedicated. The cost of the building was $1,850. Each family was asked to pay $100 toward the building fund. William Weidner mortgaged his farm in order to pay the remaining debt that was owed. 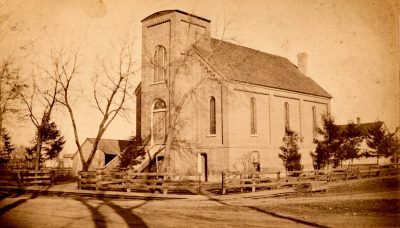 In 1878 the mission congregation had grown and eventually became self-supporting. The Rev. Emil Knappe became the first pastor. A new church was built in the same location in 1904. Some familiar local names were part of the original church – Kaminky, Grey, Weidner, Budach, and Gast. The Diamond Jubilee booklet (1943), the Centennial booklet (1968) along with other pictures and articles are available in our files. Like the Presbyterian Church, the Congregational Church started with ten members. It was first organized in 1867 with meetings being held in Dupee’s Hall (later known as the Odd Fellow’s Hall). 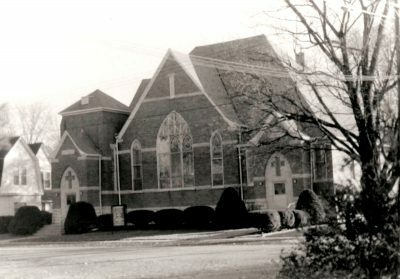 Local members were contracted to build a church on the northwest corner of North and Third Streets. The building was dedicated in 1870. It is stated that William Mann financed much of the building project. Their first pastor was Rev. C. Harrison. Prominent names in the early church included Dupee, Seely, Wilcox, Lynn, Mann and Chapman. The Congregational Church existed for 59 years when, in 1929, it dissolved for lack of membership (“too many Protestant churches in town”). The property was turned over to the Congregational State Association which razed the buildings. 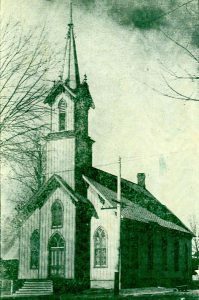 A pamphlet with the history of the Congregational Church is available in our files. The Universalist Church was known as “progressive” in its day. In 1867 preliminary meetings were held at the home of Charles S. Munson and a committee formed. Services were held in Robinson Hall, and the first Board of Trustees included Russell Cain, Chauncey Todd, Thomas Perdieu, A.C. Burlingame, George W. Norton and Munson. S.T. Stilson donated the lot as well as $100 toward the building of a double-spired house of worship costing a total of $15,000. Rev. W.S. Ralph was the first pastor, however, in 1871, the first female pastor in Earlville, Miss Mary Graves, was hired. In 1914 the Universalist Church failed, and the property was sold to Robert Strong for $2,000. Strong used the bricks from the church structure to build a home with double-brick construction. This home still stands on the northeast corner of Ottawa and Church Streets. There is record of German Methodist Church south of town – possibly near the Budach property? In 1906 Walter Pratt purchased the building and used the lumber to rebuild the Triumph tile works.